For many businesses in the hospitality industry, the kitchen is usually buzzing with activity. Chefs, kitchen hands and wait staff move at a frenetic pace as they rush to prepare and deliver meals to diners. With the mix of flames, hot oils and cooking surfaces, and high powered cooking appliances it’s not surprising the risk of fire in commercial kitchens is high. A kitchen fire can be a dangerous and frightening experience. Fire can start in a small appliance or in built-up grease in narrow ducts without anyone even knowing and can quickly spread throughout the kitchen and beyond. I feel it’s important to remind business owners and restaurant managers of the importance of installing an effective fire protection solution. Fire protection really is one of the most important investments a business can make. Careful consideration should be given to identifying the fire hazards present in cooking areas. Today, more and more kitchens are using very high temperature cooking oils for the preparation of low cholesterol and low fat foods. Combining this with highly-insulated, slow-cooking appliances can make fire protection a challenging task. However regardless of how big the challenge may seem, I can’t stress enough the importance of having the appropriate fire protection solution in place. Damage to the kitchen due to fire is one thing; however life safety of your staff members must be a priority. The most appropriate fire protection solution will depend on your kitchen design, the kitchen equipment installed, and your specific needs. There are different fire suppression systems and fire equipment available which can provide a high level of protection. I’d advise doing some research and consulting with your fire protection specialist to identify what is most appropriate. Wormald has designed systems for cafes, restaurants, fast food outlets, school canteens, hotels and hospital kitchens and offers two pre-engineered kitchen fire suppression systems which work in different ways. The ANSUL® R-102™ system is installed directly in the hood of ductwork and cooking appliances while the ANSUL® PIRANHA® is ideal for kitchens with high temperature cooking oils and slow cooking appliances. 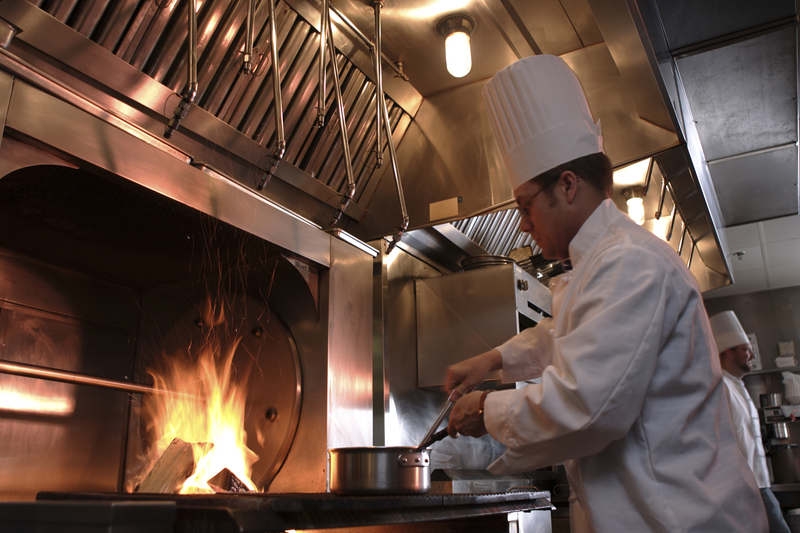 Most commercial kitchens will also need a range of fire protection equipment such as portable fire extinguishers, fire blankets or fire hose reels. Fire safety training for management and staff should not be overlooked as training can ensure that everyone knows what to do in the event of a fire. Fire protection for any building or facility is a complex task. There’s a lot to consider and for some business owners it can be overwhelming. Fire and Rescue NSW has developed a helpful small business fire safety fact sheet which can be viewed here. This includes plans and procedures which can help prevent fires and advice on how you can help your business recover should an emergency occur. This entry was posted in Fire protection planning and tagged commercial kitchens, fire safety, fire suppression system, kitchen fire, restaurant by wormaldblog. Bookmark the permalink.